Note: This is the bound book only and does not include access to the Enhanced Pearson eText. To order the Enhanced Pearson eText packaged with a bound book, use ISBN 0134027426. A brief, user-friendly, solid look at the action research cycle and the knowledge to work through each step. 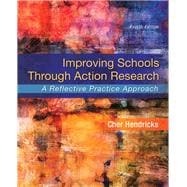 In Cher Hendricks’s Improving Schools Through Action Research, educators learn what they need to know about the action research cycle and get practical help for working through each step of the cycle–from choosing a topic and generating research questions to analyzing data and reporting results and conclusions. In a clear, concise, user-friendly approach, the author helps readers through the entire process with specific, practical information that incorporates some of the latest online and professional resources, a more detailed explanation of how to analyze and interpret qualitative data, and instructions on formatting the research paper using the latest APA guidelines. The Enhanced Pearson eText features embedded videos and tutorials. Cher Hendricks directs the University of West Georgia’s Center for Teaching and Learning. Her areas of expertise are action research, scholarship of teaching and learning, educational research, and program evaluation. Cher has been a teacher of students with disabilities at the elementary and middle school levels, a K-12 program evaluator focusing on STEM education, and an associate professor of educational research.